Posted on October 12, 2014 by Elizabeth E.
As the Governor of California recently signed a bill banning those single-use shopping bags that we all get at the grocery stores, we’ve all been buzzing about what to replace it with. There is still the paper bag, but a section of the bill suggests paying 10-cents for each shopping bag (even though Ralph’s and Trader Joe’s now offer them for free). Whether you hate this bill or love it, a shopper still needs to come up with a way to carry their groceries home. I made my first bags out of lightweight canvas, and figured out how to get two out of one yard of fabric. Because these are canvas, I didn’t need to put the handles all the way to the bottom seam. However, if you are making it out of lightweight cotton, you might consider doubling up on that to make it sturdier, or yes, buying some webbing for your handles. Whenever I use these, I get positive comments from the checkers. . . and a whole slew of awful stories about those re-usable plastic bags that some people have. One clerk told me that he unzipped one and a whole bunch of moths flew out into the store. Another talked about the smell of those bags that are re-used and re-used. 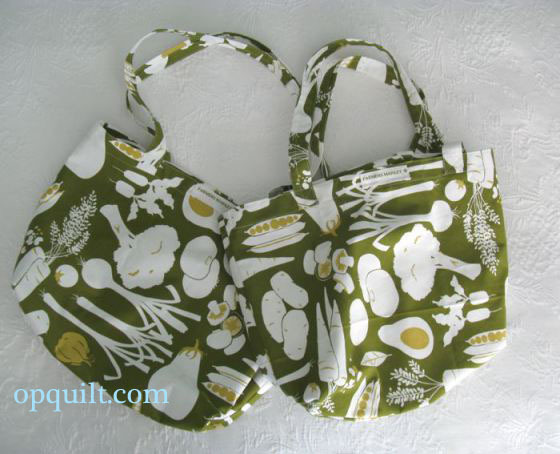 I think we quilters have the best possible world with our cloth bags, which can be thrown in the washer. Apparently bags at the produce counter and at the butcher’s counter are still okay, so I don’t have to worry about those grocery items messing up the cloth bags. 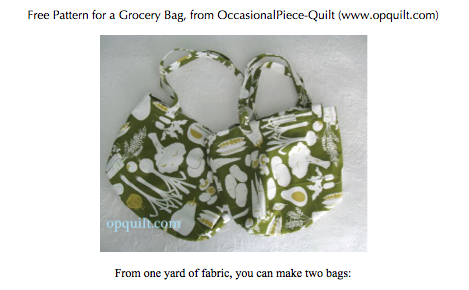 I’ve written it up in a downloadable PDF pattern that is free: OPQuilt’s Shopping Bag Pattern. Just send back some good karma, if you wouldn’t mind, and always practice good attribution, acknowledging that it’s from OPQuilt.com. To do so, please do not post the pattern on your blog, nor print off five copies for your friends. Instead link back here, and let them print off their own. Thanks.